Research is without doubt the most important thing to do in fishkeeping before you take any decisions and set out to buy anything. But for an inexperienced fishkeeper who is new to the hobby it can be difficult to know what to research, how and why. We frequently see posts on fishkeeping forums from new fishkeepers asking for help; once their story unfolds it’s not unusual for someone to ask why they didn’t do any research beforehand. Many people who fall into difficulties think they have done their research and are often surprised and upset when others accuse them of not doing so. Fishkeeping is a hobby that often falls victim to what INJAF refers to as ‘everyone knows’ syndrome. For example, ‘everyone knows’ fish only grow to the size of their tank …don’t they? This unfortunate myth is one of many that continue to cause problems in fishkeeping, especially for newcomers who, not unreasonably, think there is some truth to these widely spread myths. The ‘perceived knowledge’ that surrounds the hobby can lull new fishkeepers into a false sense of security, and lead them to believe that they don’t need to do much research because, well, ‘everyone knows …’. Many newcomers to the hobby rely, not unreasonably, on advice from shops. Unfortunately, as with shops of any type, this can be a bit hit and miss; some are great while others are not so great. If you’re lucky enough to find a shop that gives good advice it’s a good idea to build up a good relationship with them as they may be able to help out in times of need. Keeping a pet of any sort requires the keeper to have found out about that pet and ultimately that’s the responsibility of the keeper. A shop can provide general advice and guidance but if you’ve not done any research of your own you won’t know what questions to ask and there are likely to be breakdowns in communication leading to misunderstandings on both sides. Shop staff won’t always know what sort of research, if any, their customers have done (some customers can be quite disingenuous!) or what previous experience, if any, they have. Staff may assume you know more than you do which could easily lead to misunderstanding. Remember that shops are not just in it for the money, a good shop will care about the animals they are selling. Then there is the problem of poor information and advice being presented as fact. The internet can be a great source of information, unfortunately it can also be a source of terrible information. Books can easily go out of date as new discoveries come to light, and improved practices are developed. Anecdotal advice can also be a problem; just because someone else did something ill advised and claims that everything was ‘fine’ doesn’t mean that this is a good example of best practice. At INJAF we aim to promote best practice and share reliable information and resources with others. We hope this article will help newcomers to the fishkeeping hobby by helping them to understand what sort of things they need to research, which are the best places to look for information when doing research, and why it’s important to research. What research should you do before you start fishkeeping? The nitrogen cycle and the fishless cycle are arguably the most important aspects of fishkeeping for anyone to research. The nitrogen cycle explains the biological activities that take place in the aquarium to detoxify fish waste and keep your fish safe from pollutants. The fishless cycle prepares your aquarium for fish by recreating the biological activity that makes the nitrogen cycle work. It’s really important to research both of these so that you understand what is happening in your aquarium, how to spot signs of problems, how to rectify these problems, and to avoid one of the biggest reasons for fish disease: poor water quality. It’s generally considered easier to find fish to suit your water supply, rather than having to adjust your water to suit your fish. It is possible to adjust your water to suit your fish, but you do need to understand the processes you are adjusting so that you are able to maintain stable water conditions. To test for pH take two samples of tap water, test one immediately and make a note of the result. Leave the other to stand for 24 hours and then test as this will give you a much more accurate reading than doing it straight out of the tap. It’s important to know if there is a difference between the two tests. If there is, you will need to base further research on the results from the 24 hour test as this is what your water will revert to in the aquarium. Nitrate is often present in tap water, low levels of nitrate are preferable and this is one element that is relatively easy to adjust. High levels of nitrate can cause problems when trying to use partial water changes to lower the level of nitrate in the aquarium. There are various means of reducing nitrate, this article has more information. Why test the water before choosing fish? Different species originate in different parts of the world. Different geographical and geological areas often have very different water conditions in their rivers and lakes. There are various things that can affect local water conditions such as the type of rocks the rivers flow directly over, and the environmental conditions in the surrounding area. Different species are adapted to particular water conditions; a fish adapted to living in soft, acidic water will not take well to being put in hard, alkaline water. A camel wouldn’t take kindly to life at the North Pole, while a polar bear is not at all well adapted to desert life. Camels and polar bears are adapted to different conditions and the same is true with fish, it’s just much harder to see because water looks very similar the world over. Common names can cause all manner of confusion as some species are known by several common names, and some common names are often used for more than one species. Perhaps the best example of a common name causing confusion is ‘plec’. ‘Plec’ is used to describe almost any type of suckermouth fish which can lead to some unfortunate consequences. Plec is short for plecostomus and INJAF’s resident catfish expert, Mats Petersson tells us “it comes from the name of “the original” common pleco, which was then called Plecostomus punctatus (or another Plecostomus species). They are now called Hypostomus punctatus, etc. At the time there were only Ancistrus and Plecostomus in the trade”. The fish most frequently referred to as a common plec today is Pterygoplichthys pardalis which is capable of reaching about 16”/40cm in length. Then there are ‘butterfly plecs’ and ‘Hong Kong plecs’. These usually turn out to be Sewellia lineolata or Beaufortia kweichowensis and are actually hillstream loaches, a completely different species to any sort of Plecostomus. These only get to about 2 ½ to 3 inches/65-75mm, quite a difference to the ‘common plec’! Then there are all the other ‘plecs’, many of which have very different environmental and dietary requirements (pop onto the ‘quick find’ on planetcatfsh.com and enter plecostomus in the search to see what we mean!). Knowing which ‘plec’ you are buying can be the difference between ending up with a tankbuster and ending up with the species you were hoping for. Many can look similar as juveniles so it’s very important you check the scientific name with the retailer if you are unsure. ‘Algae eater’ is another common name that causes problems. Siamese algae eaters and Chinese algae eaters are frequently confused. It’s not unusual for fishkeepers to think they’ve bought a Siamese algae eater, Crossocheilus langei, only to discover they’ve actually got a Chinese algae eater, Gyrinocheilus aymonieri or flying fox, Epalzeorhynchos kalopterus. While the Siamese algae eater is a peaceful community fish the latter two are known to become aggressive and territorial in a community tank. Scientific names can change as species get reclassified into different groups when new information about them is discovered. However, even the old scientific name is far more reliable than many common names. Sometimes even retailers can get confused, or the species may have been mis-identified by the wholesaler so shops do sometimes make mistakes when labeling species. If you’ve researched your chosen species well this will help you spot any possible errors on the part of the retailer. If you’re unsure of the correct identification of any species you are considering, and have seen one in a shop, it’s a good idea to ask the store if you can take a photo of it. Then you can post the photo on one of our recommended forums and it’s likely that someone will be able to confirm the correct identity for you. The idea that fish grow to the size of their tank is widely spread but incorrect. Our article explains it in more detail. You should always research the maximum potential adult size a fish could grow to regardless of what species you are considering keeping. This is a key piece of information you will need when assessing what size tank the fish will require. You should use the maximum potential adult size as this is the size a species could reasonably be expected to grow to and therefore this is the size that you need to account for when considering your purchases. If you cannot accommodate the full grown adult size then you shouldn’t purchase that species. 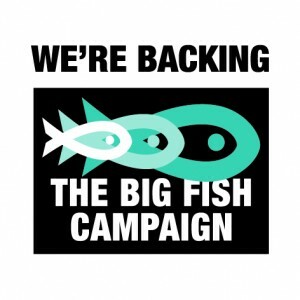 Have a read of our article on Tankbusters to see why big fish are causing concerns in the hobby, and check out the Big Fish Campaign to see what the hobby is trying to do about it. Many species of fish live a remarkably long time and you should be prepared to care for them for the duration of their lives. Due to poor husbandry and lack of understanding of their requirements some species are often thought quite short lived by newcomers to the hobby. Goldfish are a good example; many people think that five years or so is a good age for a goldfish because so many die prematurely from lack of appropriate care despite the best intentions of their owners. Goldfish can easily live for about fifteen years if they are fancy types, or well over twenty years if they are common/singletail types. As with any pet, when you buy a fish you should commit to keeping it for it’s whole life. Unforeseen circumstances can crop up, of course, but an animal living to its expected age should not be an unforeseen circumstance. This might sound an odd one but many species look similar when juvenile, and can change quite dramatically as they get older. If you make sure you are familiar with what the species looks like at various stages of life this will help you make sure you are buying the correct species when you go shopping. As mentioned above, different species originate in different areas of the world and have adapted to live in a wide variety of water conditions. Water conditions are often referred to as water parameters and are frequently given as a range on caresheets and profiles. If a caresheet gives a range for a particular water parameter it’s wise to consider the middle of the range as being the thing to aim for. For example, if temperature is given as 22-28 you will be safest going for 25. The lower and upper temperatures are generally the limits a species will tolerate, the ideal will be in the middle. Fish kept outside of their preferred range are unlikely to be as healthy as those living in their preferred conditions. It can cause problems with the immune system, problems with osmosis (how the fish regulates the balance of fluids and salts in its body) and problems with cell structure as well as more generic problems such as lethargy and lack of appetite. It’s advisable to pay close attention to the recommendations on caresheets as these are usually written in terms of keeping species in aquariums, as opposed to ‘in the wild’. Some species will absolutely not tolerate living with other members of their own species (sometimes referred to as ‘conspecifics’ meaning ‘of the same species’). The Siamese fighting fish, Betta splendens is a good example. The males are incredibly territorial and will fight to the death to keep another male out of their territory. On the other hand, some species most definitely do need the company of their own sort in order to feel secure. If you are considering buying a shoaling species you should ensure your aquarium has enough room for at least six adults of that species. Keeping a shoaling species as a lone specimen is likely to cause a great deal of stress as it will feel insecure and intimidated by others in the tank (regardless of whether they actively bully it!). Some species see other species as snacks, certain species can’t help themselves from nipping at long fins, some will bully other species for territory or food, some need particular ratios of males to females to keep romance induced exhaustion to a minimum … the list goes on! Some good examples would be keeping large, predatory cichlids such as oscars with smaller fish; this is not recommended as sooner or later the cichlid is very likely to munch on its tank mates even if they have lived together since babyhood and appear to be the best of friends! Another example is that keeping long finned fish such as guppies with known nippers such as tiger barbs is not recommended. The fish aren’t being unkind, they’re just naturally inclined to nip at long flowing fins so it’s not wise to give them the chance and risk someone getting injured. Understanding the nature of various species will help you decide if they will enjoy sharing an aquarium and help you avoid any losses or injuries. We’ve already talked about different types of water, but you should also find out a bit more about the general environment the fish originates in. For example, does it prefer fast flowing mountain streams or slow flowing gentle rivers? Does it like a particular type of substrate? Does it need anything special as décor to make it feel at home? Shelldwellers, for example, are not called shelldwellers without good reason. Does it need caves or hidey holes? Does it like a densely planted layout or will it be happier with just a few rocks? Understanding the environment a fish has come from can also help you understand how and what it likes to eat. For example, hillstream loaches like to graze on micro-organisms found in algae growing on rocks; their natural habitat is fast flowing streams with rocks and stones on the bed providing just this sort of food source for them. Getting the décor and environment wrong can cause stress which in turn can lower the immune system and cause various health issues. Getting it right will mean your fish will be much more confident and at ease, and will behave a lot more ‘happily’. It’s important to have a stock of appropriate food in store for your fish. You should make sure you research the dietary requirements of any species you are thinking of buying to make sure you are catering for them properly. Some species will eat almost anything at any given opportunity while others have very specific requirements and will refuse other food to the point of starvation. As well as knowing what to feed your fish, you need to have a good idea of how much to feed them. Young fish will usually benefit from smaller, more frequent feeds as they aren’t able to eat a lot in one go but need a good supply of food to help them develop and grow. Older fish will need different amounts depending on species. Many fishkeepers are told not to overfeed and often inadvertently underfeed their fish instead (see the ‘diet’ section of this article for more information on the problems of underfeeding). Goldfish are a good example; they are often fed just a few flakes as the owners are so concerned about overfeeding them. However, goldfish are big fish with big appetites and need a good amount of food to develop properly and remain healthy. Some fish very rarely, if ever, reproduce in captivity while others are at it like the proverbial rabbit and produce fry in a seemingly endless round of babies. Livebearers are very happy to breed frequently and in large numbers so you need to be prepared to deal with any babies and decide if you want to keep them. Aquariums can easily become overstocked if fish breed so you need to be aware of how likely your chosen species is to spawn, as well as how it spawns. Some species can get quite ‘boisterous’ when spawning and the females can get injured and become exhausted if the males are too keen. In some situations you may need to be prepared to separate males and females if things get too hectic for the female. Some species like to form long term partnerships while others will happily try it on with anyone. Some species can be very territorial and aggressive when breeding and tank mates should be chosen with care to avoid any conflicts. Some aquarium species are endangered in their natural environment. It’s well worth checking the status of species you are interested in as this may make a difference to how you choose to purchase them. We have an article about the IUCN Red List and aquarium fish which goes into more detail. There are some things that all set ups will need and some things that are more specific to particular set ups. Our Beginners Guide to Aquarium Equipment will guide you through the sort of things that most freshwater set ups will need. For more specialised advice we recommend you join one of our recommended forums to get advice tailored to your plans. It’s important to make sure that your equipment is suitable for the species you want to keep, for example oscars are renowned for being a bit enthusiastic with their décor and can break glass heaters while species such as hillstream loaches really benefit from a high flow in the aquarium so it’s wise to invest in a good pump or powerhead, or even a manifold system for them. Be wary of ‘starter kits’. If you’ve done your research properly you’ll know that these kits are just that, starters, and not in any way a suitable life long home for the goldfish they are often marketed at. It’s your responsibility to know that the majority of fish species will outgrow starter kits; it’s not the responsibility of the shop to explain it to you. They may assume you know this, and with it often being said that assumption is the mother of all mistakes you can be fairly sure this will quickly lead to problems. We recommend you look on all these sites for any species you are considering as it’s always best to read up from more than one source. You may find slight differences between them but this is only to be expected when different people with different opinions and slightly different levels of expertise have worked on something. However, we are happy to recommend these sites as being reliable sources of information. Our recommended forums section will also help you find additional advice and guidance. If you are interested in a specific species there are often clubs and associations dedicated to various species so you are likely to find some useful information there. Organisations such as the British Cichlid Association (BCA) have their own websites (see below) and often their own specialised forums where you can get detailed advice on specifics. The Federation of British Aquatic Societies also has some useful links to local clubs and societies. ‘General purpose’ forums like those in our recommended forums section often have members who are also members of specialist clubs, societies and forums so it’s a good idea to ask about these. There are various magazines such as Practical Fishkeeping which will help with general information. If you are interested in finding a good book about any aspect of fishkeeping it’s a good idea to ask on a forum for recommendations as you are more likely to find something reliable if experienced keepers recommend something. Be honest with yourself; if you can’t find the answer you want there is a very good reason for that. It’s important to accept that what you want might differ greatly from what you can reasonably have. The needs of the fish should always be a priority and come first over any desires for a particular species you may have been harbouring. Remember too, that if several sources say no, and one says ‘it was fine’ it’s very unlikely indeed to have been fine. And it is very unlikely to be fine if you try it. At INJAF we are only interested in promoting best practice, we want to help your fish thrive rather than just survive, and we want you to get the most out of your fishkeeping rather than struggling on with something that isn’t going to work. Are you a ‘Wildy’ or a ‘Farmy’? Time to up your social skills in the aquarium!